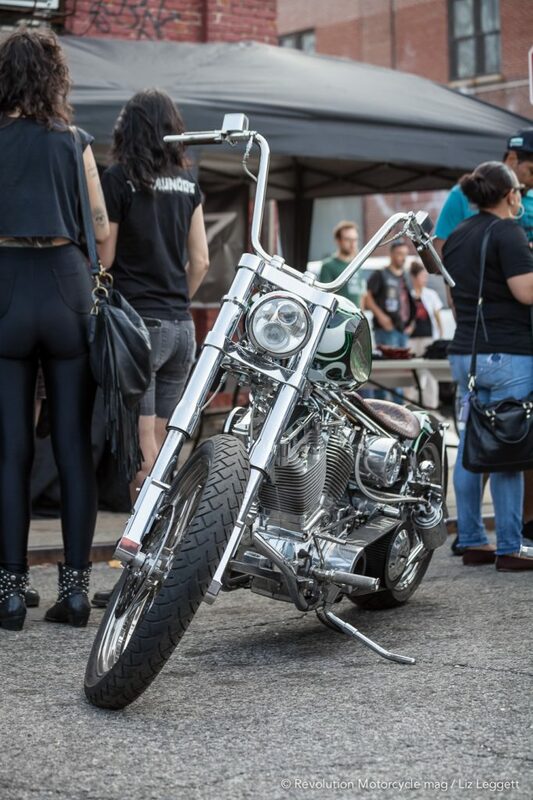 The 13th annual ‘’Block Party’’ was held at Indian Larry’s, in the heart of Brooklyn, on September 17. Although this edition was marked by some particularities, the classic Northeastern American event was very well attended. Like every year, the entire area was closed to traffic and both sides of the street were packed with motorcycles. People set up booths to sell products, display motorcycles and, most of all, show support and enjoy the crowd. As usual, it was a real party and the festive atmosphere was helped along by the “Coney Island Brewing Company” which offered three beers with each entrance ticket. Although the event’s main venue was inside the shop, which was open for business and being used as a tattoo studio for the occasion, the main attraction was in the neighbouring streets. It is always impressive to see so many bikes in the same place, especially in the trendiest neighbourhood in the world. 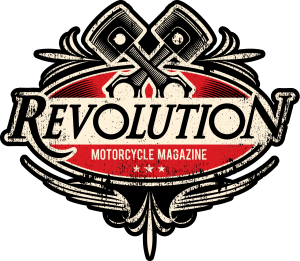 Motorcycles were lined up over several blocks, their owners beside them, discussing their modifications or where they came from. This is what really gives the annual “Block Party” its charm and notoriety. Fans from all over America come here to be among their own. 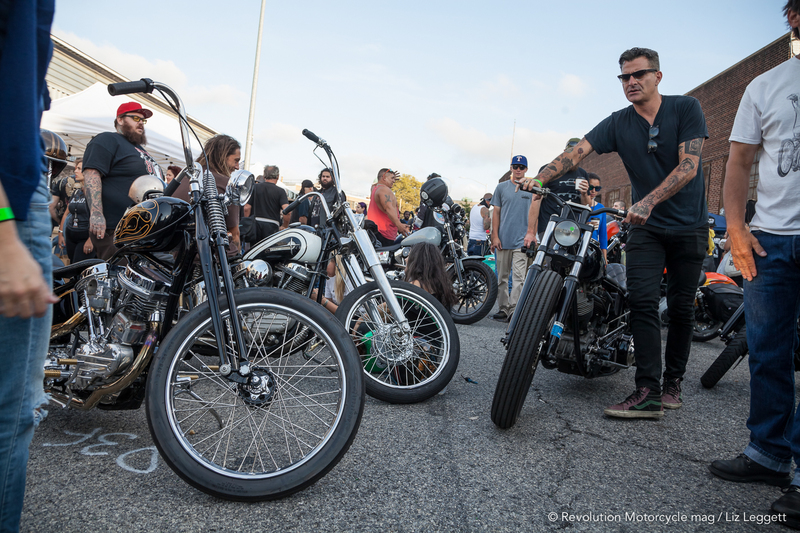 Some of the bikes were just as impressive as those within the walls of Indian Larry’s, some of them had travelled hundreds, even thousands, of kilometres to attend the event. After making the rounds and talking with several Americans, who never fail to be impressed that Canadians arrive by motorcycle, it was time for the show. For the first year, the “Brooklyn Invitational” was not held on the same date as the “Block Party.” However, following the popularity of the West Coast movement, a “stunt show” was held in the street. 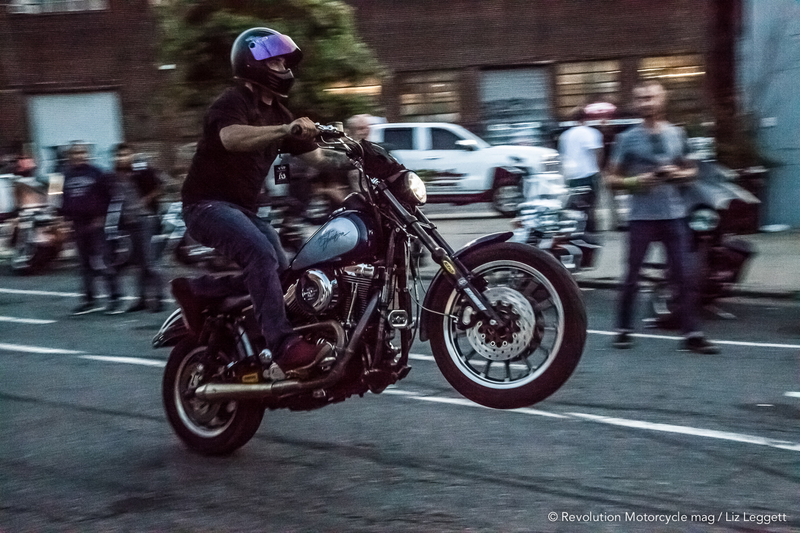 The “East Coastin’ Crew” took over Whyte Avenue on their Harley-Davidson Dynas. The three daredevils had a great time burning rubber on the street as the amazed crowd looked on. 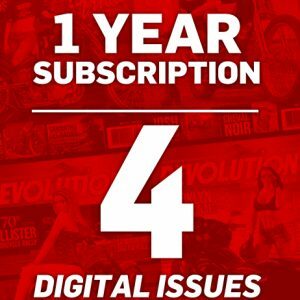 Coming from a background where popping wheelies and pulling other stunts on a motocross in the streets is the extreme activity of choice, they had no problem transposing their talents to American road bikes. In view of the success on the West Coast of “Unknown Industries,” the pioneers of the movement, they wanted to put on the same type of show on the East Coast. It is absolutely amazing to watch them perform in the street devoid of safety barriers between the riders and the spectators, a distinctive aspect that underscores their reckless “street” aspect and total lack of restriction. 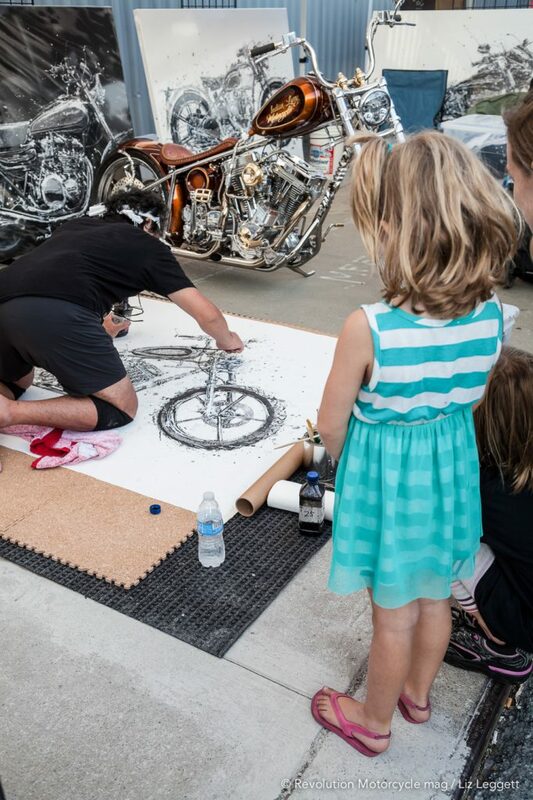 However, this entertainment filled the void left by the “Brooklyn Invitational” which showcases the creations of “bike builders” from across the country. It was held the following Saturday, September 24. Following the show, as tradition dictates, everyone goes to “The Gutter” for one last beer. This legendary bar in located on the corner of Indian Larry’s street. 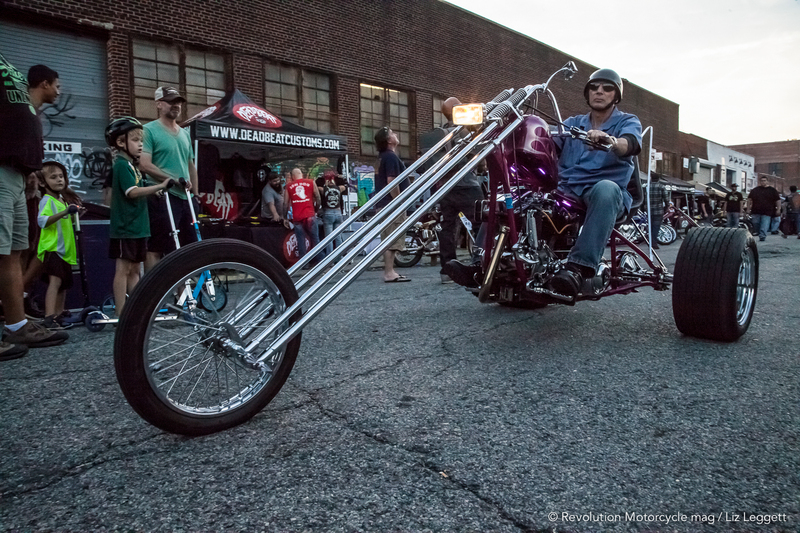 Getting back to the motorcycles, especially those exhibited at the “Grease Monkey” Block Party, the quality was lower than in previous years. This was because many of the old Harleys decided to come for the Invitational weekend rather than the Block Party. Even so, several bikes from the Eastern American clubs stood out with their unbelievable paint jobs. The creations by the host shop were by far the most impressive. 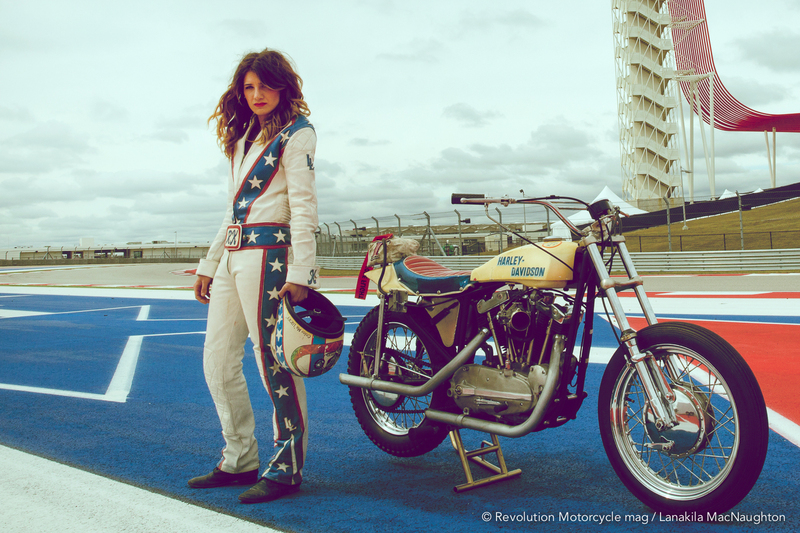 Among these was ‘’Wild Child,” a Pan-Shovel (rear Panhead/front Shovelhead engine). 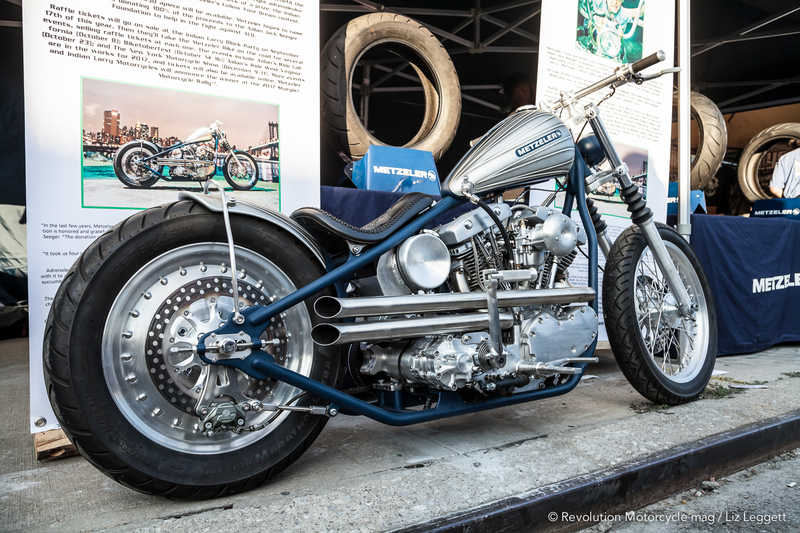 It was one of the late Larry’s classics: with a twisted frame, exceptional and high-performance mechanics, the ape-hangers giving it a chopper look, a tiny rear fender and minimalistic parts to make it run. It was Larry’s last creation during the Discovery Channel’s famous “Biker Build-Off,” which he finally won against Billy Lane in 2003. 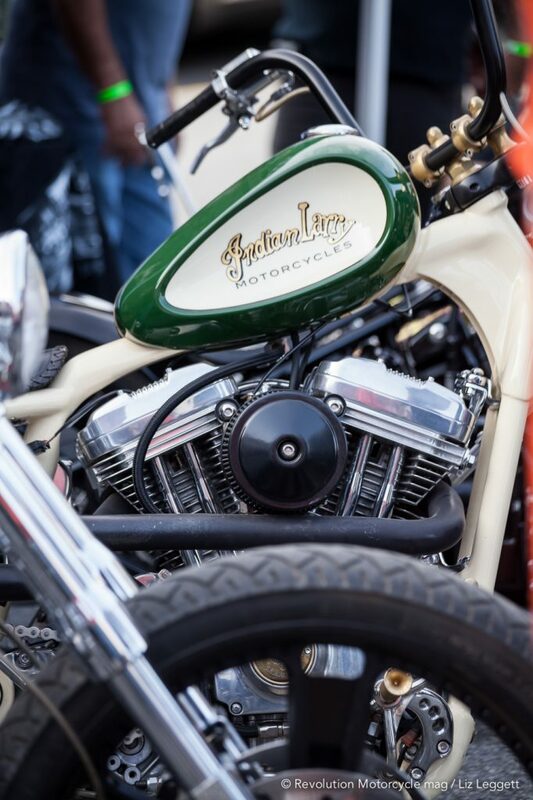 Every detail of the motorcycle was awe-inspiring, from the open-belt painted with the bike’s name, a dual carb and root beer colour paint incorporating Indian Larry’s logo and its place of creation that is, and will always remain: New York City. 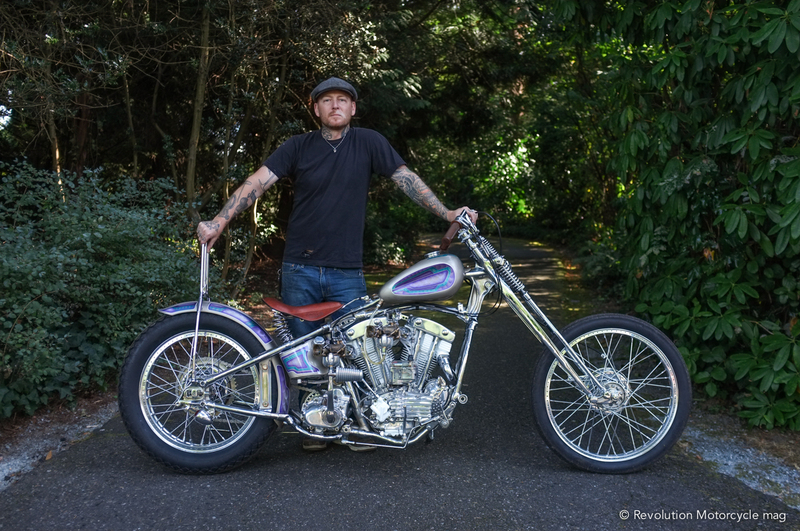 Another motorcycle on site was “Sweet Marissa,” another chopper-style bobber with the same inspirations but integrating an S&S 113 cubic inch engine with an inverted front fork to accommodate the machine’s power. 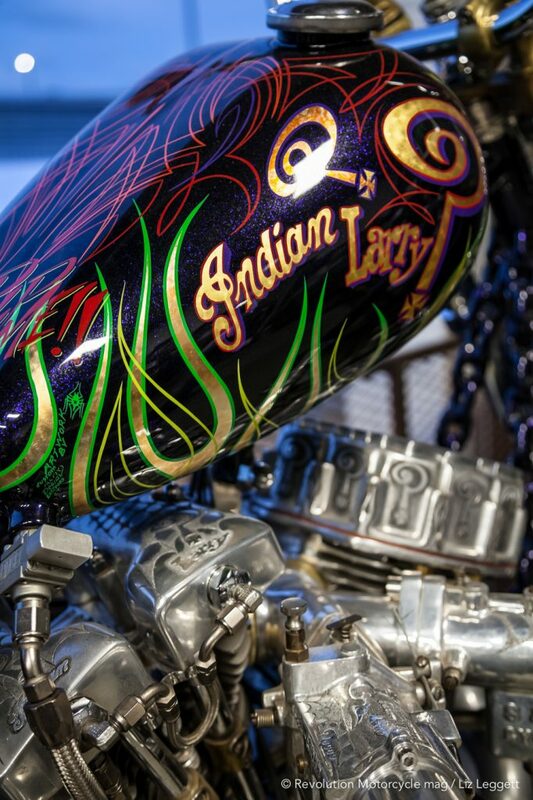 This creation was assembled in 2011 by Bobby Seeger and his team in the same Indian Larry style. 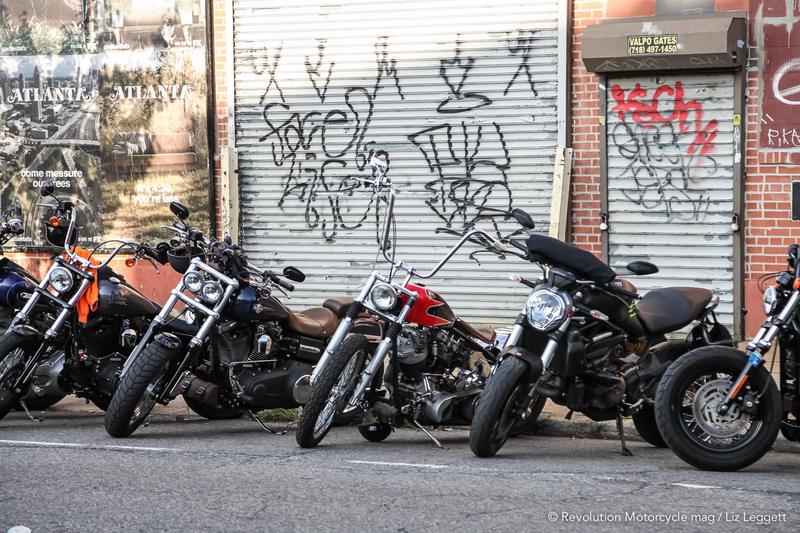 The line-up of motorcycles from the Brooklyn shop did not stop there. 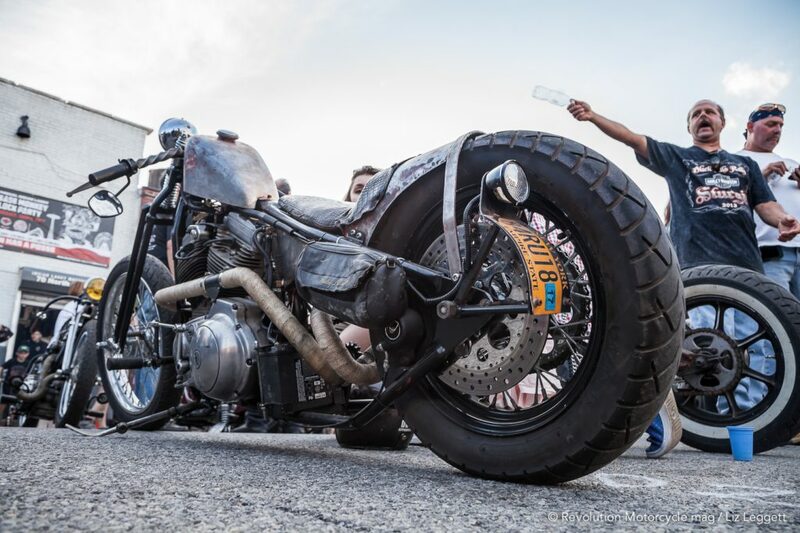 There was “Moving On,” originally a 2008 Harley-Davidson Nightster, gleefully modified in the image of the most recent creation; the “Metzeler” which follows with a different style and lines while remaining just as impressive in industrial grey giving it a very industrial and streamlined look. Last but not least, the “Chain of Mystery” was exhibited in front of the forged metal doors at the raised entrance. 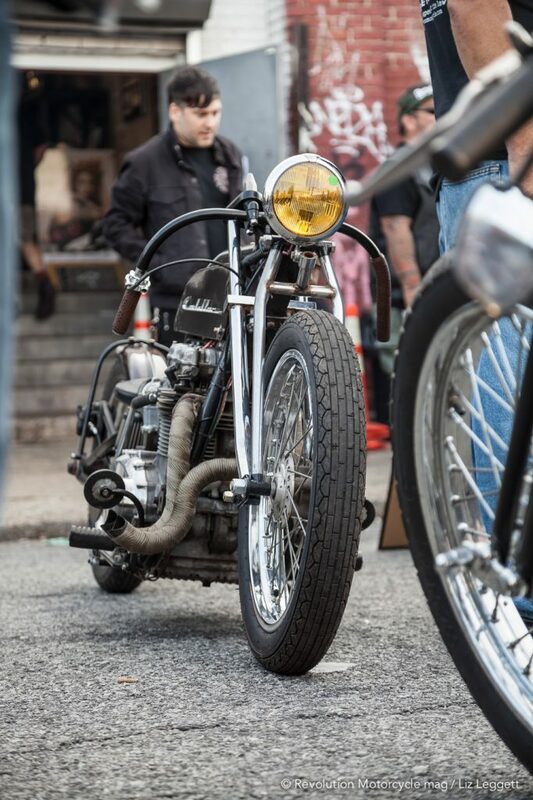 Although I have seen, analyzed and observed this motorcycle for many years, it still retains its mystical aspect. 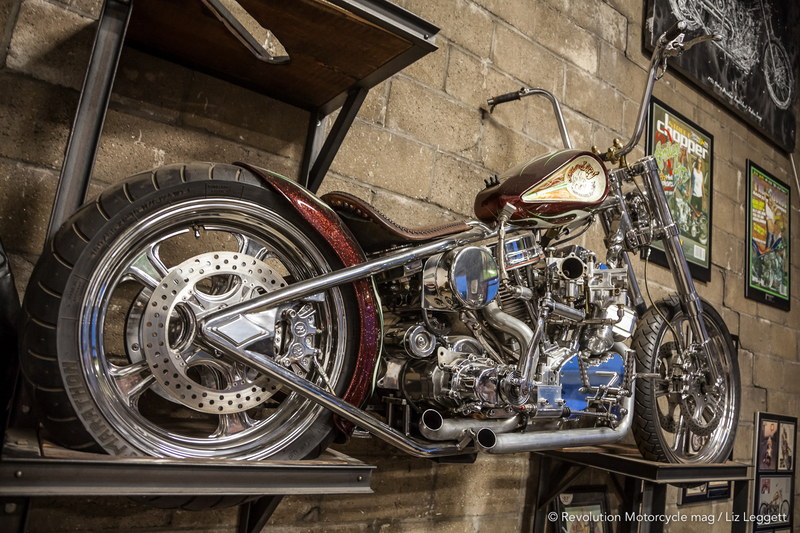 This work of art never goes out of style and remains undefeated in the world of custom motorcycles. I may be biased about the machine that made me fall in love and pulled me into the obsession of this world, but I have never seen anything so detailed – made with such good taste and creativity. 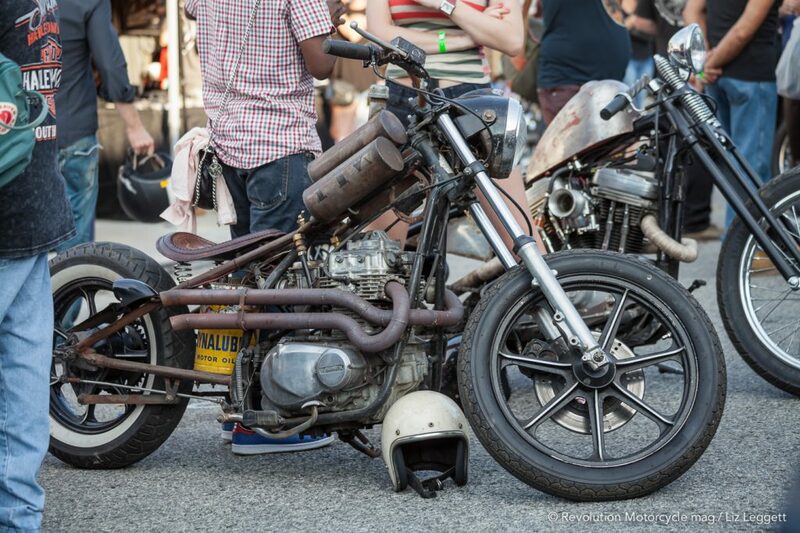 Great weather, streets full of motorcycles and crowds of interesting people made it one of the best events of the summer. But despite this, the “Brooklyn Invitational” left a void. All in all, this 13th edition of the “Grease Monkey Block Party” was a great success. 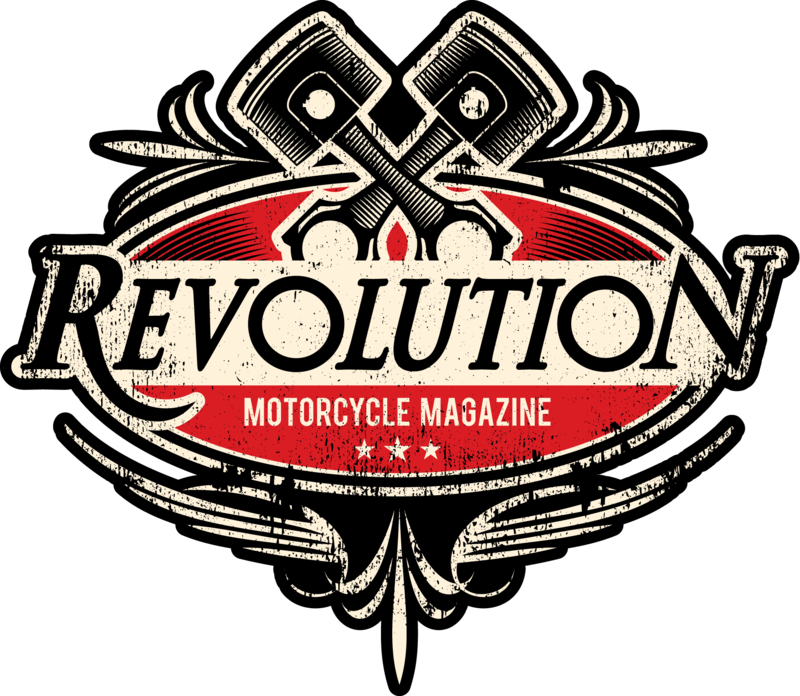 And once again I strongly recommend it to all East Coast custom motorcycle enthusiasts.